Proof that the world will end not with a bang but a whimper: Snooki saying "Waaah." The S&P Styling Product Index surged higher on Tuesday as the cast of MTV’s “reality” show, The Jersey Shore—including noted economist J-Doww—rung the opening bell at the New York Stock Exchange. No, seriously! This quasi-apocalyptic event actually holds some interest for economic sociology. In what may be the ne plus ultra of performative economic action, a group of young people who make their living performing* obnoxious ethnic, class and gender stereotypes appeared on one of the world’s great stages for performing the capitalist market economy. The event seemed to be greeted with universal dismay, from observers who found the Jersey Shore cast to be insufficiently “true” to their on-screen selves (?!? 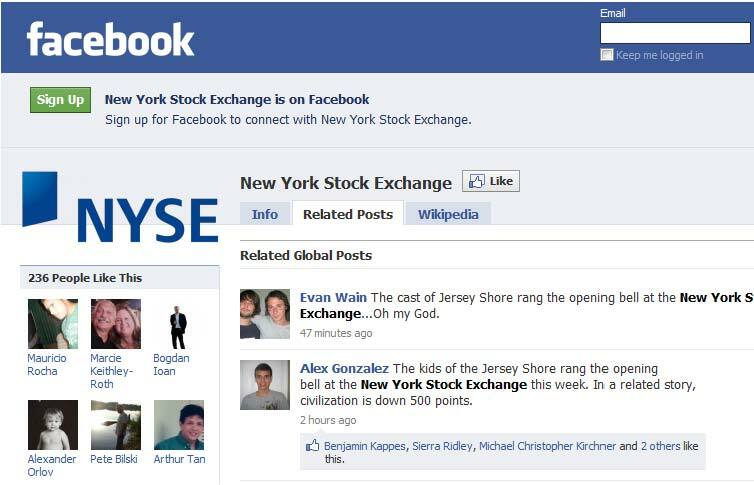 ), to those who saw their presence at the Exchange as a kind of sacrilege, judging by reaction on the NYSE’s Facebook page. I’d like to suggest that what seems so wrong with that picture of Snooki and company ringing the opening bell actually makes a lot of sense sociologically. If this meeting of worlds—entertainment and the stock market—seems strange, it may be because we’re so used to regarding the markets as “real,” rather than as a performance (or even as entertainment in their own right). But sociological researchers are building the case for treating markets as no more “real” than “reality TV.” As Michel Callon has written, “economics . . . performs, shapes and formats the economy, rather than observing how it functions” (1998: 2). This theme of economists creating markets was picked up and elaborated by Donald MacKenzie and Fabian Muniesa, who argued persuasively that by describing and predicting market behavior, economists create self-fulfilling prophecies (Merton 1949), thus performing the markets they claim to observe as outsiders. As an example, the idea here is that when economists—or the chief economist of the United States—says the American economy is in recession, it becomes so. The statement makes the situation real rather than conjectural. Which brings us back to The Situation and friends. Perhaps the most troubling aspect of their appearance at the NYSE is not their incongruity, but how very much they belong there. As performers famous for simulating reality, they have something important in common with economists who perform markets by stimulating the reality they purport to describe. Both are engaged in producing what French sociologist and cultural theorist Jean Baudrillard calls “the simulacrum:” a copy without an original, a pretense that replaces and ultimately negates “reality” so successfully that we no longer care about what is real. One sort of simulacrum is the “referent:” someone or something that represents something else, as the cast of The Jersey Shore is purported to represent a segment of American society. Another sort of simulacrum—the dominant type in a post-industrial age—is the model, which becomes more real than the reality it supposedly represents. And model-creation, particularly the development of models that reframe a messy reality in clean and elegant terms, is a specialty of economists. …he could have been writing the job description for the Jersey Shore castmates, as well as for the economists whose declarations of recession and recovery animate the markets. In fact, Baudrillard foresaw the collision of the entertainment and economic spheres through their shared use of models and representations to supplant reality. His body of work, starting with Simulacra and Simulation in the early 1980s and continuing through Impossible Exchange in 1999, implicates Wall Street and academic economics in the same project as Disneyland and Hollywood. 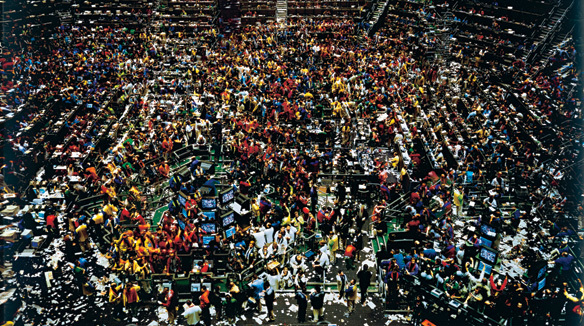 The pageant of the Chicago Mercantile Exchange, produced by artist Andreas Gursky. The language of the spectacle consists of signs of the ruling production, which at the same time are the ultimate goal of this production…The spectacle subjugates living men to itself to the extent that the economy has totally subjugated them. That Gursky image is a favorite of mine. It is especially impressive in person. All those people...aren't doing anything. Rather than "simulacrum" I think the common idiom used on the floor was, "characiture of himself." For example, "Did you here Joey try to bid in MOT? He sounded like a characiture of himself! 'Ey, MOT. You got it to do, I got it to do, we got it to do. Lets do it.'" We could not figure out if the attempt at communication was influenced by some nascent desire to emulate a "Mob Movie", a grammatical impediment from years of confusion between the Brooklyn vernacular and the colloquial Staten Islandish, or perhaps some sort of extrapolation of Arthur Fonzerelli brought forward from the 1950s to the 1980s (nb the quote was taken from the late 1990s). Whatever the case, it stands as the standard for what was billed as the center of capitalism...only that speech was not standard and the NYSE was not the center of capitalism. Why, then, are so many upset by the cast of Jersey Shore ringing the opening bell? One can only surmise that the cognitive dissonance being confronted must be too awful to contemplate. In John's defense, the whole hype behind floors is rather amusing. CNBC broadcasts daily from the floor (at lest it did when I was last forced to watch it 18 months ago). By the time I stopped watching, they would only do close-ups of talking heads from the floor because nothing else was going on. The only movement taking place was by the CNBC reps. However, not too long ago, the pace was indeed frenetic. I have been in mosh pits and in my humble opinion, mosh pits have a different set of rules with a different agenda, but I always felt more safe in a mosh pit than on the floor of the CBOT. Brooke, interesting thoughts in this post. One problem: the economic consensus has never forecast a recession, so your "point" about when an economist says we are in recession, it becomes so is wrong, I think. Or: is it an even more devilish simulacrum? Economists are giving us the APPEARANCE of economic opinions that we want to hear, thus they never forecast recessions? Hi, Shawn .... I'm not sure what you mean by "economic consensus" but a 5-second Google search turned up this recession prediction in 2007 and another in 2008 (mainstream reporting). Here's NPR from May.